Alameda County District Attorney Nancy O'Malley. 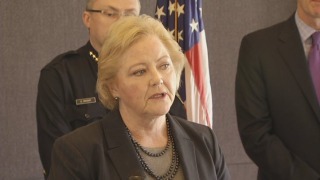 Alameda County District Attorney Nancy O'Malley announced Tuesday that her office plans to dismiss nearly 6,000 old marijuana cases in the wake of a new state law that legalizes the possession and recreational use of marijuana for people 21 and older. Proposition 64, passed by California voters in 2016, also includes a provision allowing people with past marijuana convictions to petition the court for reduction or dismissal of old convictions. O'Malley said that after the law was approved, her office established a policy, protocol, and a process to redesignate and dismiss prior cannabis-related convictions. Since that time, O'Malley said, her office has consistently handled a steady flow of petitions to dismiss cannabis-related felony and misdemeanor convictions and once California's new cannabis laws went into effect on Jan. 1 her staff has been handling those petitions on a weekly basis. "California is offering a second chance to people convicted of cannabis crimes, from felonies to small infractions, with the opportunity to have their criminal records cleared," O'Malley said in a statement. She said, "We join our state officials and intend to reverse decades of cannabis convictions that can be a barrier for people to gain meaningful employment." From November 2016, when Prop 64 passed, through the end of 2017, 609 petitions were calendared and granted in Alameda County Superior Court, according to O'Malley. The District Attorney's Office has identified about 5,900 cases that are eligible for dismissal. O'Malley said her office has identified 5,000 individuals who suffered those convictions and is continuing to identify the remaining people who fall within the law. She said the District Attorney's Office is continuing to initiate actions to dismiss those remaining convictions and people will be notified by mail to the extent that's possible. San Francisco District Attorney announced a similar plan to dismiss old marijuana cases last month and said his office will review up to 4,940 felony convictions and 3,038 misdemeanor convictions. O'Malley said people who believe they are eligible to have their prior marijuana cases reviewed for redesignation, dismissal, or sealing should contact her office to expedite the process of review and action. She said people can email the District Attorney's Office at CannabisDismissal@acgov.org and her staff members will contact them.